David and Ruth shared a recent experience ministering to a Muslim man in Nigeria. 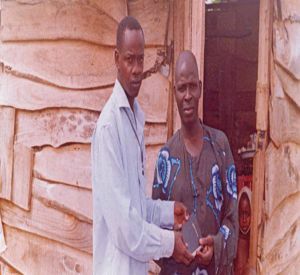 Not only has he given his life to Jesus, but David and Ruth's ministry has been able to give him some financial support to help care for his wife and seven children, helped build a safe home, and are giving him materials to continue to grow in his new faith and learn more about Jesus Christ his Lord and Savior. We pray that this salvation will be an open door into the Muslim community for David and Ruth. Photo is David and new Christian.